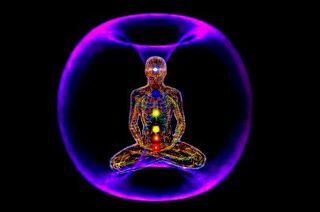 Interested in reading New Age books about holistic healing, the Tao, Qigong, and other related topics? Then, the second book in the series by Ricardo B. Serrano, R. 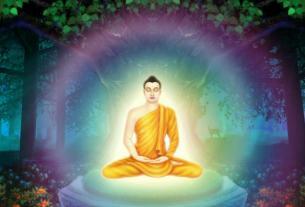 Ac., Return to Oneness with the Tao, is just the book for you! In it, the talented and always informative author covers many topics that, when combined, will aid YOU in healing yourselves emotionally and physically, and in your personal spiritual awakening. The insightful commentaries and quotes from the Tao are worth the price of the book in themselves, but you will also learn Taoist meditation and Qigong inner alchemy techniques like lower dantien breathing, Microcosmic Orbit Qigong, primordial Wu Ji Qigong, meditation on twin hearts, and Tibetan Shamanic Qigong (relax; it’s all explained in the book). And before and after follow each other. 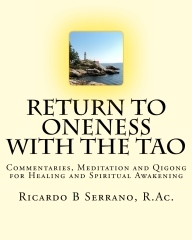 Return to Oneness with the Tao by Ricardo B. Serrano, R.Ac. is a worthy addition to the series. We, as humans, attain knowledge and enlightenment in a series of steps, much like steps (or series of books) Serrano has written. This is a book that you’ll want to add to your personal libraries if you read and enjoyed the first book, and it can be enjoyed as a stand-alone book. Once you read it, you’ll want to get the entire series. NOTE by Ricardo B Serrano: Thank you so much for your review. I love getting feedback from readers and I am glad that you enjoyed the book. I would appreciate your taking a few minutes to post your comments or a brief review on my amazon page at http://www.amazon.com/author/keystohealing. Use the book links to go directly to the review form. Look for the “customer review” section down the page and click on the “write a customer review” button to the right. Reviews are helpful to shoppers, raise awareness of a good book and persuade people to buy it. I would be grateful for your help.